Top: Viewed from Foothill Boulevard, the campus buildings engage a series of outdoor spaces. The new buildings reflect the pitched roof and massing of several distinguished buildings on the campus. 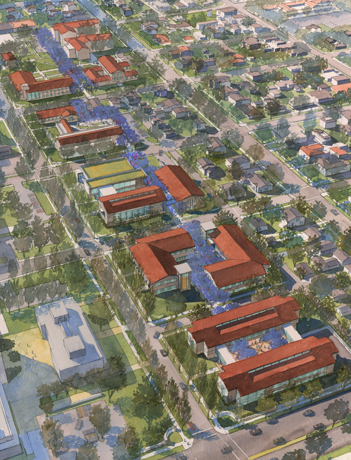 The physical campus plan reflects the strategic vision and educational program of Claremont Graduate University (CGU). The master plan took place over 14 months beginning with academic planning that engaged the university administration, faculty, staff, and students. Three planning horizons illustrate the build out of the campus over approximately thirty years. 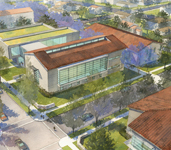 The first increment of building will include two new key facilities for CGU—a university center and a arts and humanities complex. The university center complex will become CGU's central focus of activity. With 50 percent of the campus's study area, a 250 seat auditorium, conference and classrooms, and expanded food service, the facility will provide a place for the community to meet for social and intellectual exchange. The campus master plan was prepared in anticipation of CGU undertaking a public process of review and approval by the City of Claremont. This campus master plan and associated documents are part of an internal campus master plan. These are not public record documents.